CONVERSABLE ECONOMIST: Leveraged Loans: A Danger Spot? In the aftermath of the Great Recession, we all learned to beware complex lending structures, which can crumble like a house of cards if repayments don't happen on time. A central ingredient in the financial crisis from 2007-9 were "collateratized debt obligations," which were essentially a way of putting a group of subprime mortgage loans into a financial security, structured in a way that the credit rating agencies would rate a large portion of their value as safe. Financial regulators and the Federal Reserve didn't pay enough attention to the dangers of this financial legerdemain. Now yellow warning lights should be blinking in the area of "leveraged loans," which can be defined as "a large, variable-rate loan originated by a group of banks (sometimes called a syndicate) for a corporate borrower who is perceived to be riskier than most." 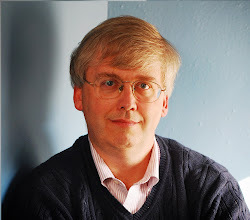 Alex Musatov and William Watts lay out the issues in "Despite Cautionary Guidance, Leveraged Loans Reach New Highs," in the September 2014 Economic Letter published by the Federal Reserve Bank of Dallas. 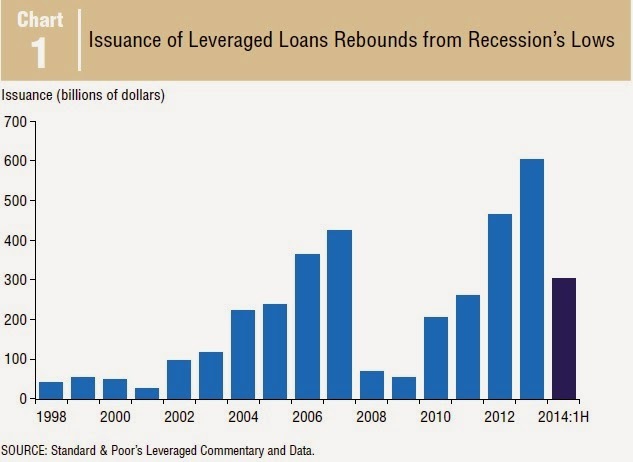 The issuance of leveraged loans spiked just before the financial crisis of 2007-9, then collapsed in 2008, but has now rebounded to new highs. the riskiest borrowers or the most complex loan agreements. 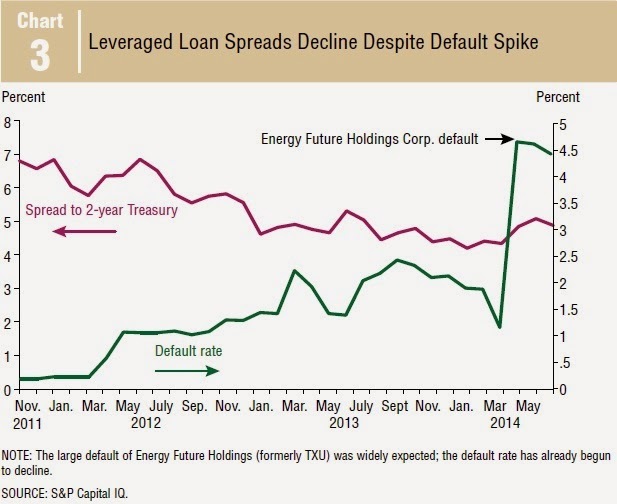 Of course, there's nothing wrong or underhanded about leveraged loans. It's just one of the ways in which modern finance works. It's not easy for firms with with a less-solid credit record to borrow, and this is one of the ways it can happen. Of course, because such firms pose greater risks, they also need to pay a higher interest rate. But if the syndicates are making too too many of these loans, while taking the fees and then selling the loans along to investors who are eager for a higher return, then there a danger that a bubble is rising in this market. sound leveraged lending activities ..." What are some of the danger signs in this kind of market? One signal is that the firms that are borrowing in the market sign a "covenant" contract, in which they make various promises about the total amount that the borrower will borrow, the value of short-term assets on hand that can easily be sold, limits on long-term investments, and so on. 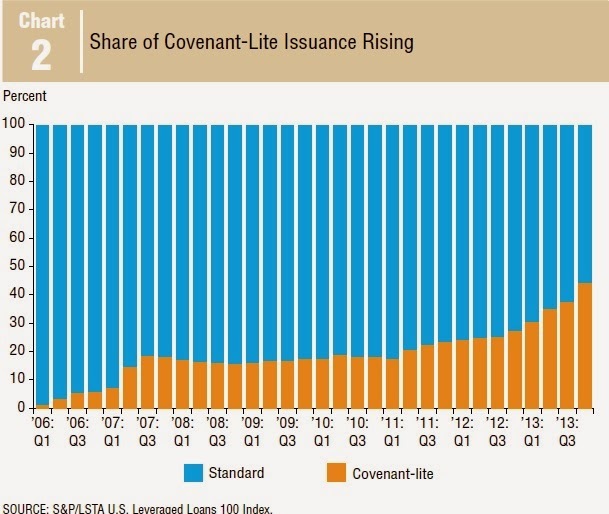 However, more and more leveraged loans are using "covenant-lite" approaches, where these rules are loosened--thus making the loan a riskier one. While covenant-lite loans are becoming more popular, the additional interest rate charged to the borrowing firms--to account for their higher risk--has been coming down. The red line shows how much the interest rate "spread" on leveraged loans, above the baseline rate on U.S. Treasury borrowing, has been sagging over time. The green line shows the default rate on such loans, which has been rising over time. In short, the risks of such borrowing seem to be rising while the extra interest rate charged to such borrowers to compensate for the risks is falling. The Committee recognizes that low interest rates may provide incentives for some investors to "reach for yield," and those actions could increase vulnerabilities in the financial system to adverse events. While prices of real estate, equities, and corporate bonds have risen appreciably and valuation metrics have increased, they remain generally in line with historical norms. In some sectors, such as lower-rated corporate debt, valuations appear stretched and issuance has been brisk. Accordingly, we are closely monitoring developments in the leveraged loan market and are working to enhance the effectiveness of our supervisory guidance. What ultimately concerns me is not the specifics of the leveraged loan market by itself, but the thought that there are likely to be similar niche markets out there, invisible to most of us in their day-to-day operations, but with some potential to melt down in a way that could cause broader financial and economic distress.